I would estimate that I spent approximately two years of my life in Bournemouth. We moved down there in my late teens, when it had a reputation as a retirement town during the day and as one of the drugs capitals of Britain during the night. During the school holidays I worked at a pizza takeaway, starting my shifts in the morning and sometimes finishing in the small hours. After the night shift I would go down to the beach and watch the sun rise. Sometimes I would get there just after the nightclubs had kicked out. Faint shadows of copulating couples moved silently in the moonlight as the tide lapped the shore, reminding me of turtles laying eggs in the sand! When day turned to night – what a town of two halves Bournemouth was in those days! I wonder if it still is now? Several years ago, Bournemouth decided to host an air festival. It was so successful that it is now repeated every year around the August Bank Holiday. We have been a few times. The aircraft fly over the sea as spectators watch from the beach. Alternatively, spectators observe from the East Overcliff Drive. Whilst watching from here sets you back a bit, it also elevates you so that you feel almost as if you are on the same level as the action. And that is something of a unique angle of observation. The Red Arrows always appear at the Bournemouth Air Festival; they are one of the highlights. One year they were staying at the same hotel as us; we were in awe to be so close to these quite ordinary men who could perform such amazing displays. We didn’t go to the 2011 show. It was just after that show on 20 August 2011, that Flight Lieutenant John Egging, who flew Red 4, crashed and was killed. The Red Arrows had just finished their display. As they broke off from their formation to land at Bournemouth Airport, Egging experienced a pull of 6.3 times the force of gravity. He suffered an Almost Loss of Consciousness (ALOC). One of his fellow Red Arrows shouted over the radio for him to check his height, but there was little reaction from him. It is believed he started to regain consciousness three seconds before he crashed and brought the nose of his aircraft up, but it was too late to eject or avoid hitting the ground. It was estimated at hi inquest that he might have avoided crashing had his aircraft been another 70 feet higher. The Coastal Path in Bournemouth runs under the cliffs, but today, when I was visiting family, we didn’t go down to the beach. We took a short stroll along the East Cliff to see the memorial dedicated to Flight Lieutenant Egging. This memorial was erected just over a year after Flight Lieutenant Egging’s death. It is based on a design by children at the Kinson Primary School in Bournemouth. Those children should be proud; many would consider such as design as the pinnacle of their career. The sun was setting as we arrived, and I took a photograph with the sunset, also managing to get the memorial in the foreground with Bournemouth Pier in the background. My brother and fellow Guest Walker, Alex, is a master at post-production. He turned my photograph into something quite spectacular. We hope to have walked our way into Bournemouth by summer 2014. When we follow our Coastal Path we will be walking along the Undercliff Drive, below the cliffs, and so will miss this memorial which is on the East Overcliff Drive above. Perhaps, however, we will climb the zig-zag path up the East Cliff and pay our respects once again. This entry was posted in Dorset and tagged Bournemouth, coast, Dorset, Jon Egging, memorial, Red Arrows, travel, walking. Bookmark the permalink. The memorial is stunning – and what an image! 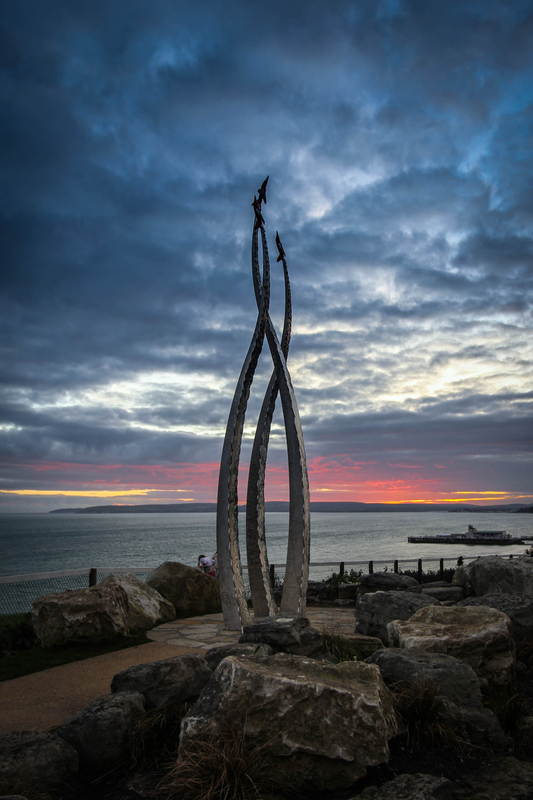 Really a wonderful shot of the Bournemouth Memorial – Kudos to you and Alex.